Shipping $6.44 Add item to cart for shipping estimate. You can SAVE on shipping by buying multiple items from the same seller. Shipping is charged by each individual seller. Sellers at times may also provide FREE SHIPPING on select items or on entire order if it meets the minimum order value. Please check sellers page for more details. 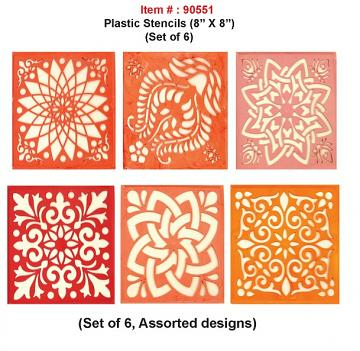 Plastic rangoli stencils to make instant rangoli anytime during the festivities. DIY - Make mess free traditional rangoli designs for a festive environment. *Buy 12 or more sets and save $1 on each set. Shipping Cost $6.44 Buy multiple items online from Indian Root to SAVE on shipping. All orders processed in 1 to 3 business days. We ship across USA and use UPS or USPS for all your shipping needs. For any FREE SHIPPING promotions, we use economy shipping option. FREE Shipping if available is only applicable to contiguous USA. There may be additional charge for shipping to Alaska, Hawaai or Puerto Rico. We will let me know of any additional shipping charge once your order is placed. We DO NOT ship to PO Box. All products are shipped from our warehouse in CA, USA. This item in Unique Diwali Gifts category was first added to our catalog on 09-07-2018. 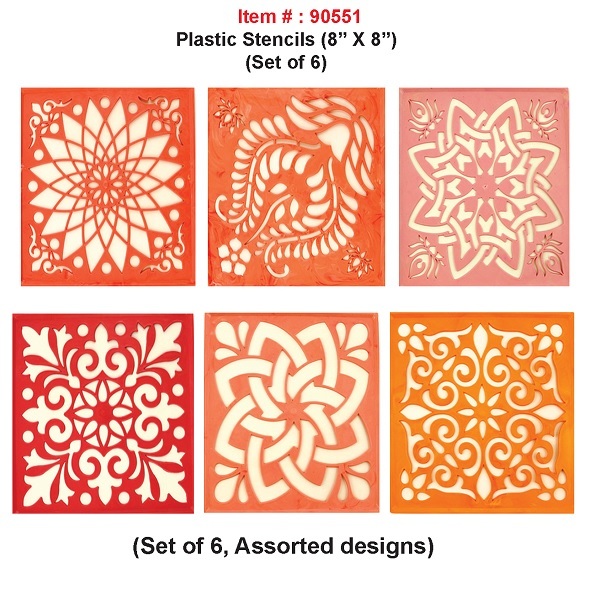 Buy Rangoli Stencils For Festival Decoration 8"X8", 6 Traditional Design, sold & shipped by Indian Root where you can shop online for Exclusive Collection of Ethnic Indian Gift & Home Decor Item. This Rangoli Stencils collection has been tagged as diwali decor, vijaya dashmi rangoli, navratri festivities, indian festival celebration. Note: In case of handcrafted products, you may notice some irregularities in finishing which is part of the manufacturing process. Laxmi Ganesh Murti w/ Golden Decorative Diya Puja Thali for Diwali 8"
Oxidized Stainless Steel Pooja Thali Set Return Gift - 8"
Sankheda Design Wooden Bajot / Puja Table / Home Decor 12" X 12"
Traditional Sankheda Design Wooden Bajot / Puja Table 18" X 18"
Copper Matka / Kalash for Water Storage 8.5"
Very good quality. Arrived on time and the purpose was met.